The first step in figuring out how much it costs to build a swimming pool is deciding what type of pool you need. Gunite swimming pools are the best option for people who are serious about installing an in-ground swimming pool on their property. Gunite pools are the most durable choice, and they are the most flexible. You can choose almost any shape and design. Gunite pools have a rebar frame that the installer sprays with a cement and sand mixture. The process provides more durability and more flexibility with design and shape compared to a poured-concrete pool with a wooden frame. Certainly, other pool options, both in ground and above-ground, will not match the durability or the attractiveness of a gunite pool. We will take a closer look at how much it costs to build an in-ground pool. The region that you live in can, surprisingly, increase (or decrease) pool construction costs. Size and shape will also affect the final price tag. The placement of the pool can add to the cost. You may want to include extra features both inside the pool and on the pool deck. Safety additions can be valuable, especially if you have children. Efficiency features could lower operating costs even though they add to the initial price tag. You should also consider ongoing pool service, maintenance, and energy costs. You will have to cover these after the pool is up and running. Here is a closer look at how each of these variables affects the price of an in-ground swimming pool. It will be easier to dig and prepare the site for a pool in a location with a higher water table, while it could prove more difficult in a dry region such as the Southwestern US. Challenging ground prep can increase the cost of labor. You also should consider the general wage in your city, and the length of the season for pool building. In colder climates, a pool could cost more simply because the season for construction is shorter than in warmer parts of the country. In-ground gunite pools cost between $50-$75 per square foot. Of course, this can vary based on the other factors that we will discuss, but this is a “ballpark estimate” that can help you decide how large and how deep you want your pool to be. The shape of the pool may also factor into the final price. A designer should be able to help you come up with a shape that will reduce the size requirements of the pool, which could lower the cost. However, if this leads to additional preparation work, such as removing trees or adding fill to create a level pool, the price could increase. Sometimes, the best decision is to opt for the shape and size that fits with your property. With gunite pools, you have a lot of flexibility as far as shaping the pool, so you should use this quality to your advantage. Do you have multiple options for pool placement or is there only one logical place for your pool? As we have already pointed out, the cost of pool construction could increase if you have to remove trees or add fill to your property to create a level surface. You also may want to remove trees even if they are not directly in the construction area so that you are not continually clearing leaves and branches out of your pool. Zoning ordinances and permits from the local government could influence how much it costs to build a pool. You need to match these rules with your pool placement. Ordinances vary from place to place. Some cities may require that pools are placed a certain distance from the property line or that they sit away from wells, pipes, and other underground utility lines. How Much Does It Cost to Build a Pool with Additional Features? Additional pool features could include items such as a diving board or slide or other in-pool equipment. 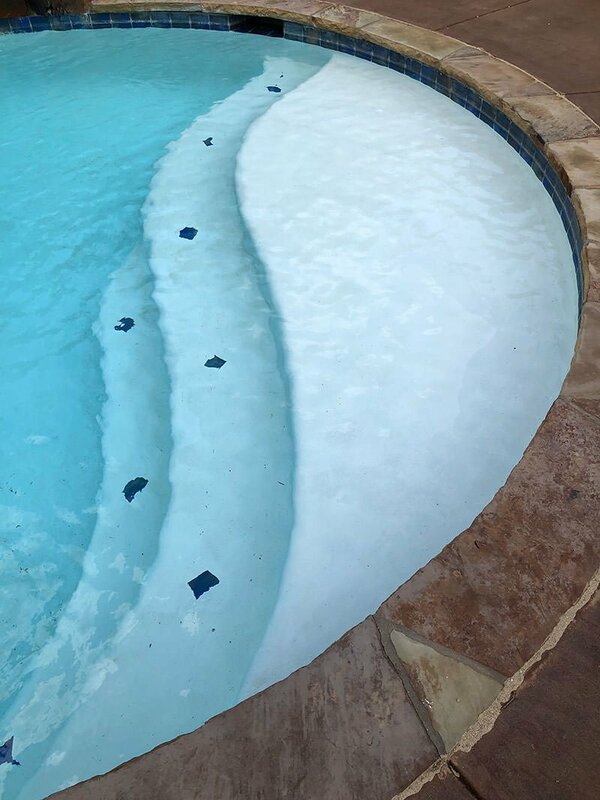 If you are trying to cut your initial pool construction costs, you could potentially add a slide or board later, provided the initial pool design leaves space for them. “Additional features” could also mean patios, outdoor kitchens, pool decks, space for tanning beds or lounge chairs, or any other items that you want to integrate with your pool and pool deck. These “extras” could be important to your vision for the pool design. 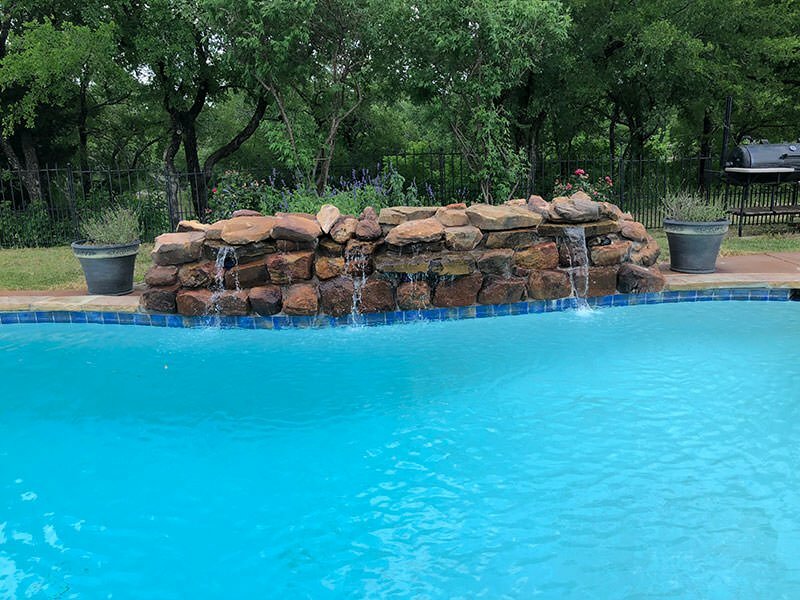 However, they are still extras, so if you are trying to cut the upfront costs of you gunite pool construction, you could leave them out of the initial plans but leave space to add them later. You should check with your pool contractor, however. If they are already there doing the work, they may be able to add additional features for a lower price. The same discount could apply to cosmetic in-pool features such as fountains and waterfalls and external additions like a hot tub or separate, shallow kiddie pool. These extras highlight a critical idea that will help you answer the question of how much does it cost to build a swimming pool: you should consider the long-term costs of the project. If additions will become more expensive later, you should consider finding a way to do them now. City ordinances may require that you build a fence around the pool area for safety reasons. Even if your town does not have this requirement, you might want to consider a fence if you have children or if you have concerns about people entering the pool without permission. If you only use the pool seasonally, you could opt for a removable fence, which you can place in storage when the pool is not in use. Pool coverings and alarms or motion sensor lights are additional security options. The other aspect of safety is your homeowner insurance policy. The insurer may increase your premiums if you do not meet its safety requirements. The best strategy is, therefore, to consult your insurance provider before you start planning your pool to find out what rules they might have. With proper planning and energy-efficient equipment, you can save money on pool operations over time. Your pool will need a pump, so you can opt for the most efficient model available that meets your pool’s size and performance requirements. You should include the estimated cost of operating the pump when you make your decision. A cheaper pump may cost more in the long term because it will use more energy than a more expensive, but more efficient, pump. You can also consider the expected lifespan of the pump and the length of any guarantees or warranties. Heating is another ongoing cost. Investing in a pool cover will reduce heating energy consumption, but you will also want to find a pool heater that has the ideal balance of initial cost and lower operating expenses. Solar pool heaters could reduce your heating bill, so you may want to at least check the pricing on this option. You will have to decide if you will do the maintenance of the pool yourself or if you will hire someone to do it. Upkeep is not an enormous cost, but you should figure it into the overall pool budget. More importantly, you should make sure to perform preventative maintenance on heaters, pumps and any other necessary pool equipment. These items should also be under warranty. Review: How Much Does it Cost to Build a Pool? Look at how much pools cost in your area. This will give you a better picture of costs than looking on the internet for pool prices in another part of the country. Once you have a “ballpark figure,” you can consider size, placement, and design. All of these could potentially lower the overall price of the pool. Remember that you need to learn about local regulations and also consult your insurance company. Then, you can start thinking about additional features and safety requirements. Efficiency and maintenance costs are the final pieces of the puzzle. When you are ready, you can reach out to a pool expert to get a concrete idea of pricing and design options for your pool. If you have any questions or would like a free estimates, contact Willsha Pools today!